Obama spoke with the Times last Wednesday after a speech in Galesburg, Illinois, an industrial town devastated by the closure of a Maytag refrigerator factory in 2004. His appearance there was the first in a series of campaign-style events focusing on his economic policies. In the interview, Obama spoke of the growth of social inequality in the US and the lack of “upward mobility” for working Americans. “And that’s what’s been eroding over the last 20, 30 years, well before the financial crisis,” he said. These remarks reflect the awareness and concern within the American ruling elite of growing popular discontent over mass unemployment, rising poverty and cuts in vital social programs alongside record stock prices, corporate profits and CEO pay. There is a potential, Obama was hinting, for a rapid growth of social opposition. 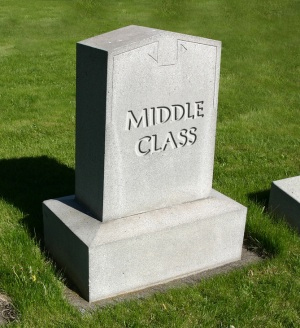 In reality, large sections of the population that previously would have been considered middle class—shop keepers, small farmers, professionals, civil servants—have been thrown into the ranks of the working class, which comprises the vast majority of the people. The avoidance of the term “working class” is part of the attempt to cover up the real source of the social crisis. To the extent that Obama pointed to social problems, he acted as though he was an innocent bystander. One would hardly have known, based simply on the interview, that he has been in office for four-and-a-half years, let alone that he has been pursuing, and continues to pursue, policies that have devastated the living standards of working people and contributed to a deepening of the economic slump. Most striking was Obama’s failure to mention—and the failure of the Times to raise—the bankruptcy of Detroit, which had been announced just six days prior to the interview. Obama’s supposed “obsession” with the plight of ordinary people somehow failed to take into account an unprecedented action whose overt purpose is to use unelected officials to rip up agreements and drastically slash the pensions and health benefits of city workers and their families—a landmark event that is widely being trumpeted as the model for other cities across the United States. This was not an oversight. Obama could hardly mention Detroit while posturing as the tribune of working people, since his administration is refusing to provide any aid to the city and, in fact, supports the bankruptcy filing and attack on workers’ pensions. In other words, despite his attempt to conjure up a vast difference between his economic policies and those of the Republicans, there is agreement that no serious programs will be enacted to address the deepest social crisis since the Great Depression. On the contrary, what remains of past programs will be slashed further, the differences between his administration and the Republicans boiling down to the small change of timing and tactics. Obama rules out any significant spending for jobs, health care, housing, education, etc., having allocated trillions to bail out the banks and rescue Chrysler and General Motors with loans stipulating a 50 percent wage cut for newly hired workers. He made sure in his interview to defend the bailout of Wall Street (“We had to make sure the banking system wasn’t collapsing”) even as he foreswore any serious spending to alleviate the social crisis. Even if one were to accept Obama’s professions of concern for the middle class as sincere—and we do not—there is nothing that his administration, or any Democratic or Republican administration, could do to seriously alleviate the present crisis. The current impasse is a product of the historical crisis of American capitalism, centered in the protracted decline in its global economic position. The very policies adopted by the American ruling class to deal with this decline have eroded any possibility for a genuine program of social reform. For more than four decades, the ruling elite has been dismantling the country’s industrial infrastructure and shifting its investments to financial manipulation and speculation. The result has been a staggering growth of financial parasitism, embodied in the immense power wielded by Wall Street and the stock market over every aspect of economic, social and political life. The increasing separation of the process of wealth creation for the ruling elite from the creation of real value has led to a rotting out of the economic foundations of the United States. Today, over 50 percent of US profits are generated by the financial sector. This process of financialization has created within the ruling class a powerful constituency for the most rapacious and outright criminal policies, both at home and abroad. This financial aristocracy will brook no retreat from a policy of war and aggression internationally, and economic plunder within the US. The banks and hedge funds that hold Detroit’s municipal bonds speak for Wall Street as a whole in demanding the destruction of workers’ pensions and health benefits and the stripping of any public assets that can be turned into cold cash for themselves. Militarism abroad and social counterrevolution at home require the preparation of dictatorial forms of rule to suppress and terrorize the population. Hence the erection of vast and illegal spying networks and the buildup of the police powers of the state. There are today overwhelming economic, social and political obstacles to any, even modest, policy of social reform, such as that carried out by Franklin Roosevelt in the 1930s or Kennedy and Johnson in the 1960s. There is no basis within the framework of bourgeois policies for progressive change. If there is to be any progressive reform, it can arise only as a byproduct of the independent mobilization of the working class in the struggle for socialism. Such a struggle must be developed as part of an international movement of the working class. The banks and major corporations must be nationalized and placed under public ownership and the democratic control of the working population. The stranglehold of the financial aristocracy and the richest 1 percent of society must be broken through the mass social and political action of the working class. What confronts working people, most immediately in Detroit but also across the rest of the country, is the need to develop a socialist movement in opposition to the entire political establishment and both big business parties.